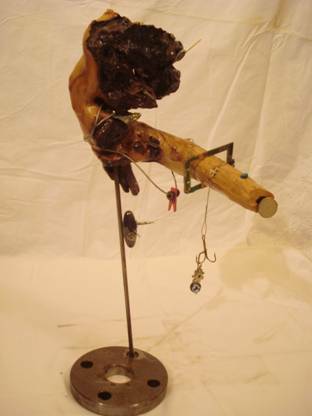 2008 Wood with peforated metal base impaling the angry bison. At its edge a mother of pearl cufflink has a hidden treasure. The expression of the eyes changes and on the side is a watch that doesn't work very well. Surrounded by steel, it washes clothes on its washing line. A door in the leg that opens might, is not a pretty sight. Three hanging hooks and a magnet with eight parts. Can you make Pinochio's pendulum balance?